TULARE COUNTY, Calif. (KFSN) -- A reign of terror turned deadly around 2:30 a.m. on Monday, when Visalia Police say Gustavo Garcia shot and killed a man outside an AMPM on Lovers Lane. Less than an hour later, police believe he went to his ex-girlfriend's house, threatening her and shooting multiple rounds in her backyard. At around 6:30 a.m., Tulare County Sheriff's deputies spotted Garcia's vehicle and started a brief pursuit. But they say Garcia's car became disabled, and he started shooting at two deputies once he got out. Those deputies were able to return shots at Garcia, who ran into an orchard. "I've had a chance to review some of the video as well and I have to tell you that they ran into harm's way. They truly are heroes," said Sheriff Mike Boudreaux. "The suspect very brazenly opened fire on those deputies. We're very fortunate that none of them were struck and grateful that they're OK. The deputies were able to fire multiple shots in return and we're continuing to investigate that scene," said Visalia Police Chief Jason Salazar. Police say Garcia carjacked some farmworkers in the orchard, but this time Visalia Police spotted him leaving the area, and started a pursuit. Near Strathmore, the California Highway Patrol says Garcia started going the wrong way on Highway 65, trying to intentionally hit other cars, going at least 100 miles per hour. 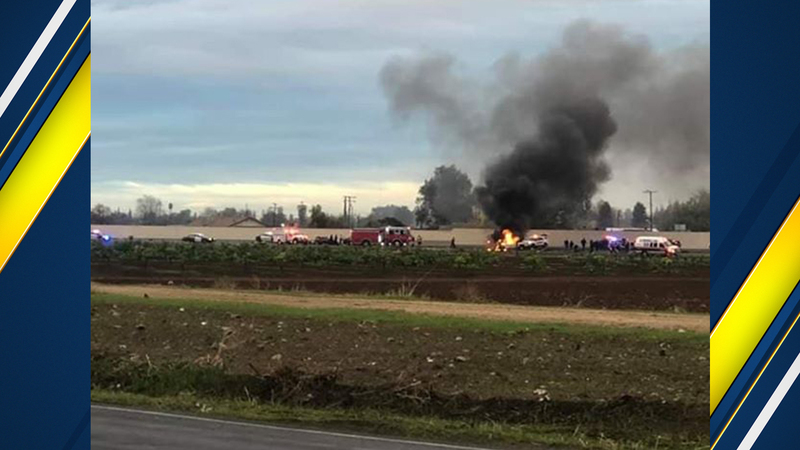 But the dangerous pursuit ended just outside Porterville, when Garcia crashed with a number of vehicles, ejecting him from his car. He died at the scene and another person who was involved is in critical condition at a Fresno hospital. But authorities say Garcia's crime scene started on Sunday, when he shot a farmworker and minutes later, held up a gas station in Exeter, making off with 2-thousand dollars cash. "During the course of the robbery, Mr. Garcia fired two rounds in the directions of the employees as well as customers in the store. The store is occupied by several subjects. Upon receiving the money, Mr. Garcia left the store, entered a grey Honda pilot SUV," said Exeter Police Chief John Hall. Authorities say Garcia had immigration holds in 2004, 2012, and 2014 and was deported in 2014.. He also had a prior criminal record. Exeter Police are also looking for another man, Garcia's possible accomplice in the armed robbery at the gas station. She's expected to survive, and when she was shown a lineup, Tulare Police say she positively identified Garcia as the man who shot her.